This post that hopes to help us explore the province of Iloilo, is dedicated to the promotion and discovery of the province tourist attractions. It also hopes to gather the right balance of information for an enjoyable online experience. WHERE IS THE PROVINCE OF ILOILO? Also known as "The Heart of the Philippines," Iloilo is rich in historical and cultural attractions, home of the famous Dinagyang festival, stately mansions, majestic century-old churches, unspoiled countrysides and exotic delicacies. As a leading province during the Spanish Colonial Era, the province of Iloilo is widely known for its beautiful old world architecture similar to that of Latin American Countries. Spanish colonial Churches are amongst the well-known tourist sites in the province. For those who love outdoor activities, Iloilo offers a visit to the oldest golf course in the Philippines at Sta. Barbara, offshore fishing, scuba or skin diving, water skiing and swimming. The more adventurous can witness and bet on cockfights on sundays. 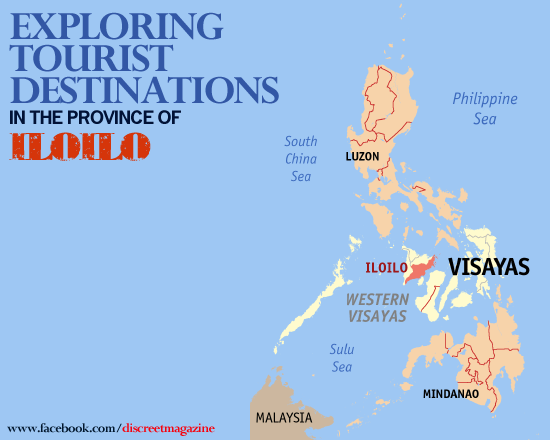 Iloilo is a province of the Philippines located in the Western Visayas region. Iloilo occupies the southeast portion of Panay Island and is bordered by province of Antique to the west and province of Capiz and the Jintotolo Channel to the north. Click here and here to know more about Iloilo. You have read this articleIloilo / Iloilo Tourist Destinations / Iloilo Tourist Spots / Philippine Tourist Destinations / Philippine Tourist Spots with the title EXPLORING TOURIST DESTINATIONS IN ILOILO. You can bookmark this page URL https://thehalflifeoflinoleum.blogspot.com/2014/01/exploring-tourist-destinations-in-iloilo.html. Thanks! Comments "EXPLORING TOURIST DESTINATIONS IN ILOILO"